Mystic Jungle is dedicated to the fight against extinction. We deal in facts, not emotion. Emotion is what drives us to do what we do, but it is the facts that helps us make the most informed decisions in regards to the outcome of the situation. If we are sent something such as an article or photo depicting another facility or private owner in a bad light, we take the time to truly investigate the situation. A video or picture is a capture of that moment in time. What is the story behind the video or picture? Our philosophy is that if we did not see it with our own two eyes, hear it with our own two ears, then we do not let it pass out of our own two lips. There can be so much more behind the photo/video that is not being told. One case is of a photo that was circulating around with dozens of cats on veterinary hospital surgical tables. The Animal Rights Fanatics took a photo of a mass spaying and neutering of cats and stated “Say no to animal testing” Link to article is here – https://speakingofresearch.com/2014/02/27/fact-into-fiction-why-context-matters-with-animal-images/ . So please investigate facts behind ANY photo or video. Animal lovers everywhere are under direct attack. Yet most are not even aware of what is going on. But it is the countdown to extinction. Not only of our wildlife, but of domesticated animals. Animal Rights has one mission. To eliminate ALL human and animal contact. PERIOD. And they are doing it one step at a time as those that either do not care because they do not think it will effect them or simply because they are not aware. The war is real now. And closing in fast. There are more big cats in captivity than in the wild – While this might be sadly true, it leaves the naive to believe that the cats here in the USA are stolen from the wild. That we are going over to other countries and knocking mom’s in the head and stealing the babies. Simply stated.. THAT IS A LIE. – There has been no importation of rare and endangered species since CITES in July of 1975. So the big cats you see today in circus’s, zoo’s (accredited or not) and sanctuaries are the direct result of over 15 generations of captive breeding programs. That the American tiger today has no conservation value. I beg to differ as well as several other scientists. They are a wealth of viable, healthy diversified DNA. When a population drops under 250 specimens, they begin to genetically bottle neck. That means they are “in breeding”. This leads to high infant mortality, physical deformity’s suppressing the ability to survive in their environment, deformed sperm, low sperm motility, and of course infertility. As in the case of the Florida Panther that has suffered a genetic bottle neck and the Yellowstone Wolves, the government brought in different subspecies to breed with the remaining population (and this was done as captive projects) and then released after a time back into their realm. Because genetic diversity was greatly needed and obtained, both the Florida Panther and the Yellowstone Wolves have made a comeback. That cub petting leads to abuse. Wow- almost no words for that one. The reasoning behind it? Because they get sold to canned hunts, road side zoo’s or killed. Well that is a lot of “what if’s” and to be honest way far fetched. Especially here in the United States. First off trophy hunters want to show off “The Kill” and what kind of a man would they portray themselves to be if they showed off killing a cub.. which by the way would land you federal time as they are protected under the Endangered Species Act. Road side Zoo? Hmmm.. well every facility out there if they are by the highway could be considered a road side zoo. It is a common belief that because a facility calls itself a “sanctuary” and is a non profit it is legit and they know what they are doing. Let me explain this.. non profit is a tax status. NOT a stamp of approval that you know what you are doing . And by the way, if you are open to the public and CHARGE admission.. you are a ZOO. Sanctuaries are NOT open to the public and if they do give tours it is on a limited basis. So non profit just means that they are not taxed on the income. It in no way changes the nature of the animals within or the facility owners ability to care for them. Now with that being said, there are laws across the US and also Federal laws that oversee the care of these animals. I am licensed by BOTH Florida (Florida Fish and Wildlife Commission) and USDA (United States Department of Agriculture) I get no less than THREE inspections a year up to six.. as do my fellow exotic owners. That big cats are a danger to the public – NO THEY ARE NOT. In every case of an attack except ONE (which btw happened at an AZA facility where two men believed to have taunted the tigress all day long and she scaled her moat, chased one down, passing her natural prey and other zoo visitors, killed him and tracked, found the second one, and mauled him ) has a big cat EVER went on a killing spree after escaping from it’s enclosure. EVER. Especially if they are raised in a HANDS ON ENVIRONMENT. The fatalities that have occurred have happened to people that willingly placed themselves into that animals environment. People such as myself. That know and except the risk. Caretakers. When you treat them as if they are straight from the wild with no contact you are begging for a disaster. Case scenario – Hands on – Been handled since a cub – A cat gets out or a barrier fence between keeper and cat is forgotten. Because the cat is used to hands on, it is no big deal. And if an “attack” occurs most likely is from accidental “Play”. Not an aggressive attack. Case scenario – Hands off – Been treated as if straight from the wild – A cat gets out or a barrier fence between keeper and cat is forgotten. Because they are in that “wild state” man is not a friend. Man is an “intruder” and must be taken out. And this can and does lead to keeper deaths in hands off facilities.What we need is to have current laws enforced. NOT new ones that are designed by the very people that are knowingly (or unwittingly doing it because they believe they are doing “the right thing”) dead set on having no animals under human care. The big cats under human care today, are most likely the last generation in both captivity and in the wild. Many subspecies such as the Malayan Tiger are critically endangered with numbers such as 250 to 350 animals. When a population drops to less than 250 it is virtually extinct for all practical purposes. Genetic bottle-necking occurs. With that comes birth defects, low sperm count, high infant mortality and shortened life spans. So how does a sub species develop? By DNA assignment. Animals that have the right attributes to survive long enough to procreate in a certain environment will pass these attributes on to their descendants. Attributes such as shorter coats with less stripes to deal with the heat and sparse vegetation. This allows for better hunting, thus the ability to survive and mate. Animals that lack these qualities will of course not survive. This is called natural selection. So how is a genetically bottle-necked subspecies saved from extinction? Exactly like they did the Florida Panther and Yellowstone Wolves. Because the wild population numbers were so low, they brought in both captive and wild populations of other subspecies to add GENETIC DIVERSITY. Then the process of natural selection begins again. After many generations the sub – species will again gain a strong foot hold as long as mankind can stop interfering. In closing, we ask that for the animals sake, no matter if domesticated or not, PLEASE do your due diligence and research that new petition, photo or video that you have been sent. Do not become part of the mob scene attacking others on social media. Become educated by researching scientific fact. Be aware of where you gain any facts (ie – some “fact giving sites are driven by parties with an agenda) Gain your facts from legit data sources. 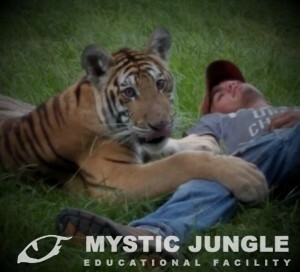 Purchase From The Jolly Shop and support Mystic Jungle.